With traditional stand off hardware requiring holes in sign panels, what other options are there that do not require holes? 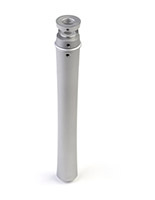 Edge mount standoffs have the ability to turn any signage into a visually arresting display panel that will not only get the message across, but will draw attention in general. These models are really one of the most versatile sign mounting styles available. Installers look at panel fasteners as just a very fancy type of nail or screw for attaching signs to walls, but there are many different uses. 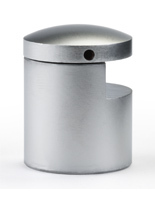 Metal edge mount standoffs come in a variety of finishes and sizes to accommodate a variety of substrates. In addition, this type of system is remarkably effective for more than just hanging office signage. These versatile fasteners can also be used as art display hangers, shelving supports, and other creative purposes. 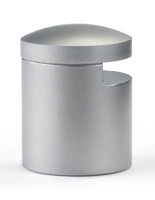 But even if the only thing needed is to mount signage in a stylish way that will capture the attention of customers, metal edge mount standoffs are a superb choice that will enhance any presentation. 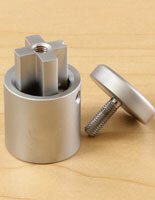 What makes side grip hardware different from other sign fasteners? Three Dimensional: Because these edge mount standoffs hold panels away from the mounting surface, they instantly create signage with a three-dimensional quality. Adding perspective to a display creates visual depth that is both attractive and appealing to the eye of passersby, and also adds a modern, stylish look. These models can hold signage at many different distances from the wall or other surface, usually from 3/4" to upwards of 8". Visibility: Unlike other standoff styles that pass through the sign itself, this type of support holds graphics by the edge. Not only does this mean that interior graphic elements of the sign are not obscured, but also that no mounting holes at all need to be drilled in the display panel itself. Signage that is not blocked by its own support mounts is clearly legible, even when full-bleed graphics are used. 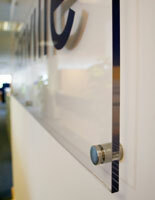 Flexibility: Because the only limitation is the depth of the sign panel itself (accepting materials up to 1/2" thick), this style of mount system is effective with signage made from any number of different materials, not merely plastic, wood, or glass, and in almost any shape or size. 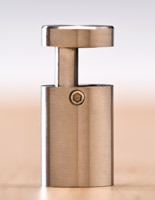 Mounts that hold a panel by gripping from the sides are limited only by the weight of the panel itself. Usability: Some wall support methods for display signs require a full set of tools. 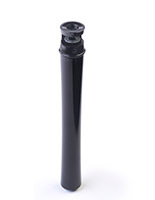 These simple fasteners need only a screwdriver to install, because they come with their own allen wrench included (as well as all necessary hardware required to mount the support posts). What are some ideas on where — and how — these display mounts can be used? Corporate signage: These display support systems are very effective when used at the company level in lobbies and other open areas. Because there are few limits to the size panel that can be displayed, they are very effective for large, branded logos. 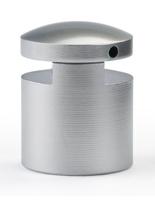 Smaller business identifiers can be mounted on interior doors in office buildings to differentiate one suite from another. Wayfinding: Hallways, entryways, even elevator interiors and walkways are all often sites where way-finder signs are posted. Directions to specific rooms, building areas, even emergency instructions and notices can be stylishly mounted with these fasteners. Individual Identifiers: This application is particularly effective at the individual level, as a door sign or even mounted on the side or front of a desk. Multiple signs create an effective display for shared spaces with several occupants, especially because this style of fastener can be used between two signs as a support for both. Visual displays: Many companies and even galleries choose this type of mounting method to showcase artwork and visual materials. School hallways, museum exhibits, even commercial galleries have all been known to use these mounting support fasteners to create dimensional showcases for visual materials. Shelving: Retail stores and individuals often use these holders as supports for glass or other shelving or even countertops, especially in conjunction with hanging systems. This unusual mounting method creates eye catching display areas that are as effective in a residential kitchen as they are in a busy retail storefront. 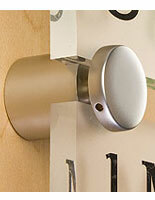 Sign mount styles have come a long way from simply hanging a panel with a nail. Today's hanger systems create visually attractive information areas that can help create or represent a company's image to the public. 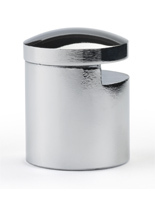 These stylish metal holders that fasten a sign or panel to a wall without needing mounting holes in the material are available in a number of different sizes, finishes, and configurations. These economical support fasteners can be used in a variety of ways to create eye-catching visual displays that hold identification, artwork, or simply information. Often considered "architectural display hardware," this style panel mount can turn a wall or door into attractive, branded displays. 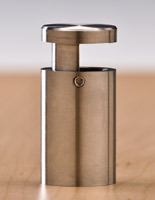 Small accessories can be an important design element that makes a big impact. SignStandoffs stocks more than just "sign standoffs" — we offer mounts and accessories in a huge number of sizes, finishes and materials to provide the widest possible variety for our customers.